Our range of products include 60 gm georgette pading fabric, net fabric diamond work, net embroidery fabrics, net multi colors work fabric, satin georgette 3d fabric and velvet work fabric. We are one of the widely acclaimed manufacturers and suppliers of 60 Gm Georgette Padding Fabric. The offered sixty gram georgette padding fabric is highly acclaimed and appreciated for sheer light weight and crepe appearance. Our supplied sixty gram georgette padding fabric is equally useful in both the summer and winter seasons. We feel proud to introduce ourselves as the well-known manufacturer and supplier of Net Fabric Diamond Work. The offered net fabric diamond work is beautifully designed for girls and women of all age groups, sections and ethnicities. 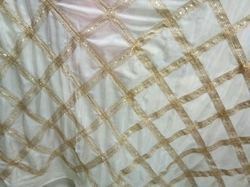 Our supplied net fabric diamond work is very popular among college going girls and working women. We are one of the well-known manufacturers and suppliers of Net Embroidery Fabrics. 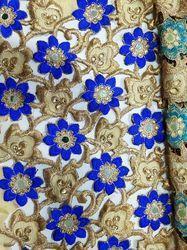 The offered net embroidery fabrics are highly liked and acclaimed for the heavy embroidery work. Our supplied net embroidery fabrics are equally popular in both the summer and winter seasons. The offered net embroidery fabrics are very affordable and economic in rates. We are one of the widely acclaimed manufacturers and suppliers of Net Multi Colors Work Fabric. 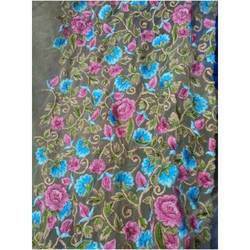 The offered Net Multi Colors Work Fabric is specially designed for stitching ladies blouse. Our supplied cut work blouse fabric is equally liked in both the summer and winter seasons. 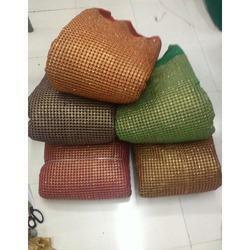 The offered Net Multi Colors Work Fabric is available at very cost effective market rates. We are one of the widely acclaimed manufacturers and suppliers of Satin Georgette 3d Fabric. The offered Satin Georgette 3d Fabric is specially designed for stitching ladies blouse. Our supplied Satin Georgette 3d Fabric is equally liked in both the summer and winter seasons. The Satin Georgette 3d Fabric is available at very cost effective market rates. We are one of the widely acclaimed manufacturers and suppliers of Velvet Work Fabric. The offered Velvet Work Fabric is specially designed for stitching ladies blouse. Our supplied Velvet Work Fabric is equally liked in both the summer and winter seasons. The offered Velvet Work Fabric is available at very cost effective market rates. We are one of the widely acclaimed manufacturers and suppliers of Cut Work Blouse Fabric. 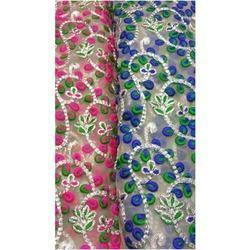 The offered Net Multi Colour Embroidery Fabric is specially designed for stitching ladies blouse. Our supplied Net Multi Colour Embroidery Fabricis equally liked in both the summer and winter seasons. The Net Multi Colour Embroidery Fabric is available at very cost effective market rates. We feel proud to introduce ourselves as the well-known manufacturer and supplier of Polyester Fabric. The offered Polyester Fabric is known for color fastness and skin friendliness. Our supplied polyester laser fabric is elegantly designed clothing material for ladies, girls and women. The offered Polyester Fabric is available at very cost effective market rates. We are one of the widely acclaimed manufacturers and suppliers of Cut Work Blouse Fabric. The offered Muliti Colors Georgette Fabricis specially designed for stitching ladies blouse. 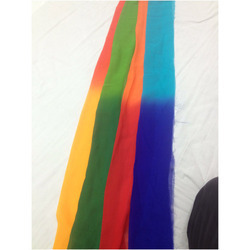 Our supplied Muliti Colors Georgette Fabric is equally liked in both the summer and winter seasons. 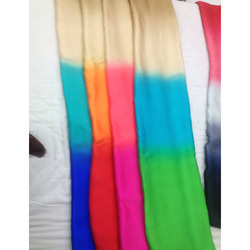 The offered Muliti Colors Georgette Fabric is available at very cost effective market rates. We are one of the widely acclaimed manufacturers and suppliers of CHINNON EMBROIDERY WORK . The offered pure CHINNN EMBROIDERY WORK is very popular among ladies and girls all age groups, sections and ethnicities. Our supplied CHINNON EMBROIDERY WORK fabric is known for color fastness and aesthetic designs. 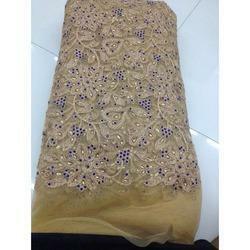 The offered CHINNON EMBROIDERY WORK fabric is very affordable in price. cut work febric use for dress material .. Looking for Designer Fabric ?